There are many terms that are unique to the truck industry. Long-time drivers know these terms well. However, those new to the truck driving industry may know some instinctively, but are unfamiliar with others. Did you realize that in the role of a trucker job, you may be called upon to do more than drive? Depending upon the company you work for the places you deliver – California and Florida-based truckers, we’re looking at you – a driver may be required to load and/or unload your own trailer, shrink wrap pallets, or do non-dock deliveries. If you are an owner-operator, you will want to be familiar with these terms so that you may charge appropriately. Why? Freight contracts typically handle these accessorial fees on an a la carte basis. It is not common for these charges to be part of the negotiated per-mile rate. One of the most frustrating duties of a driver is waiting. Waiting to be loaded, waiting to be unloaded. Even with an appointment, carriers are at the mercy of the dock. If another carrier arrived late for their appointment, but the dock allows them to unload when they arrive, it will put all other carriers behind as well. There is no good way to avoid detention, aside from always being on-time for your own appointments. Having said that, some detention is to be expected. The most common agreed upon no-charge detention that I have read in contracts is three hours. That means you can be detained up to three hours from the time of your appointment before you can begin charging. 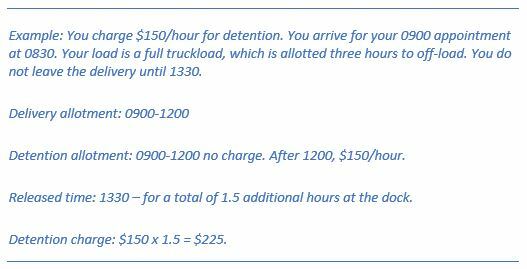 Most detention rates are calculated in one hour rates, and divisible by the quarter hour. The next accessorial fee that falls under the category of frustrating is TONU (truck ordered not used). If you do not have this covered in your carrier contract, when you renew that contract, include it! Loading/Unloading one’s own trailer is never fun. However, as the number of truck driving job openings are on the rise, and freight costs continually rising - varying in areas such as Michigan and the like - one way warehouse strive to decrease their costs is by having drivers do their own loading/unloading, therefore saving on warehouse employees. If you have never loaded and/or unloaded a trailer before, it’s not as easy as it looks, as I learned the hard way. 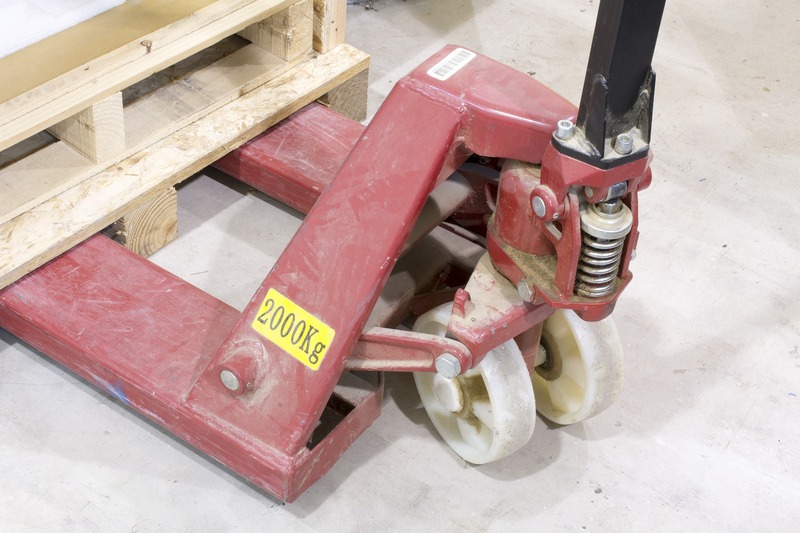 It takes practice to use a pallet jack (either manual or electric). Take time to get trained on the appropriate equipment. Once you are trained, keep brushed up on your skills so you are never caught unaware at a delivery. Deadheading might be a company driver’s dream, but it’s a dispatcher nightmare. Why? Deadheading means that the once the driver delivers the load they return to their home base empty. The run home still costs the company money in way of driver wages, truck maintenance and fuel charges. That is why a good dispatcher will always try and find a backhaul (or load to pick up on the return home) in order to recoup some of the cost. If a return load cannot be secured, it can be built into the carrier contract to charge the shipper for empty miles. This will usually only be charged for the preferred use of a carrier’s equipment. If the empty run is not due to the preferred use of the carrier’s truck, then it is not appropriate to charge the shipper for dispatch not being able to find a backhaul. Fuel surcharges are not only common, but an expected charge within the industry. Diesel fuel is a costly expense. A carrier obtains fuel cost information from the Department of Energy’s website. How the contract is typically written is that the surcharge will be based on the current price of fuel. Example: The surcharge could be rated at $0.05/mile if the fuel is currently running between $3.509 and $3.559/mile. Having a table in the contract covering predicted and/or possible to prevent the carrier from having to forecast fuel costs in order to stay profitable. Many carriers in oil abundant areas such as Texas have this information included in contracts with drivers. When a driver is required to shrink wrap her own pallets before loading the truck at the pickup location, the carrier should charge for this. If a driver is required to load or unload her own trailer with a pallet jack (manual or electrical) at either consignee or consignor, then this should be a chargeable fee. If a layover occurs at the fault of the shipper, then the layover costs that a driver must pay out-of-pocket, are reimbursable by the shipper. Conversely, if the layover is at the fault of the carrier, then the carrier should pay the driver’s costs. Tolls and border crossing fees are often built into shipping lanes within the contract and are charged, typically, for loaded miles. Circuitous miles should be chargeable when the driver is required to perform out-of-route stops. This is especially important if the load is billed at a load rate rather than a per mile rate. (i.e. The Memphis to Sacramento load is charged at $700 no matter the cost, rather than charged at a rate of $1.90 per mile. After hour deliveries are not as common an occurrence, however if the carrier only delivers during business hours as a matter of norm, then it is possible to write this into your contract as an accessorial fee. However, this is not a common fee for truckload carriers. While working in the furniture industry, I found that non-dock deliveries are actually more common than I had previously realized. What this is comprised of is if a driver has to deliver product to a location other than a dock. There is significant additional labor involved, including off-loading the truck by hand, using a hand jack to bring product at the front of the trailer to the back in order for it to be off loaded with a hi-lo from the ground. As a driver, ask your company for training on operating a lift-gate if you will need to use them. Lift-gates are fairly intuitive, but there is nothing worse than arriving at your destination and realizing the lift-gate doesn’t work because you didn’t know it has to be charged. A fee that is more common than most drivers care for, but overall not an everyday occurrence is that of diversion miles. These types of fees are accrued when a driver arrives at their pre-agreed destination and is then told to drive to an alternate location. 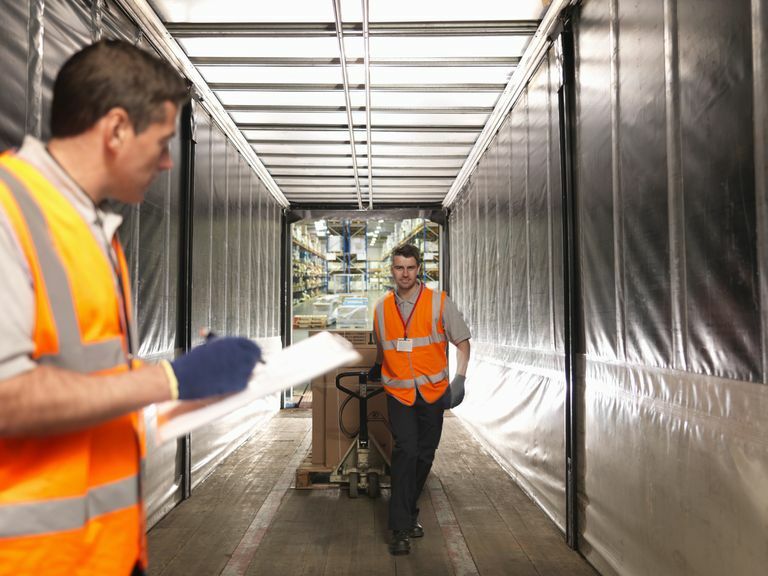 (This most commonly happens when the destination warehouse no longer has physical capacity for the load and the driver has to go to a subsidiary warehouse). Typically, the contract will allow for a set number of miles the driver may go before additional fees are charged. Along the same vein of diversion miles are additional stops. The same driver who had to drive to the subsidiary warehouse not only charges for the additional miles, but also the additional stop. When the destination cannot receive the delivery until one or two days later, the carrier is within their right to charge storage fees to make up for the fact that the trailer cannot be used for additional loads. 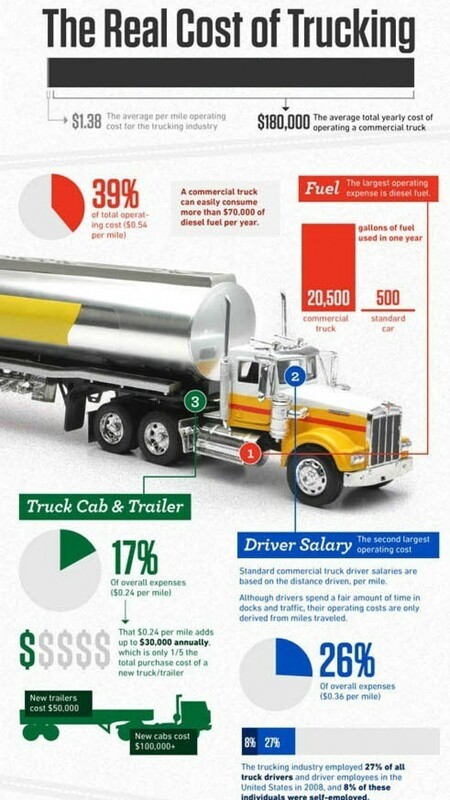 A trucking job can be expensive to an employee. Finding ways to off-set those charges is not only common, but an expected business practice. Some notable drivers, such as Allie Knight have even taken to selling merchandise of their own particular brand in order to generate some extra income. You are not “ripping off” (as it were) your customers. They are anticipating these charges. And while it may seem like good business to bid low on contracts, most companies are savvy to those tactics and have long established that they get what they pay for. A company that you want to do business with is willing to pay the accessorial fees in order to have their freight handled safely and professionally. Do not short change yourself by skimping on these fees. On the other hand, business will also see if you are attempting to gouge. Do your research before you establish fees. This will involve the use of data analytics. Make sure you employee an analyst with a proven track record of accurate results. A company cannot run their business on questionable data, after all.